The original Moto G launched last year, and it was quite a success for Motorola, being a great value but still pretty powerful Android phone. The new Motorola Moto G (also called the Moto G Second Generation) takes that formula and improves on it, coming out with a device that really does look very compelling. The old Moto G had a 4.5" 720p display, the new Moto G has a 5.0" panel of the same resolution. One the back is an 8 megapixel camera with a 2 megapixel one on the front. Inside is a quad-core 1.2GHz CPU with 1GB of RAM, and the new Moto G is available in either single-SIM or dual-SIM configurations with 8GB or 16GB of storage plus a microSD slot (depending on market). The operating system is Android 4.4 and is pretty much a pure implementation of Android without any custom skins. There's no mention of an LTE version at present, but pretty much everything else you'd expect on an Android smartphone is here. The compelling part is the price, costing €199 in Germany and $180 in the US with other markets coming very soon. 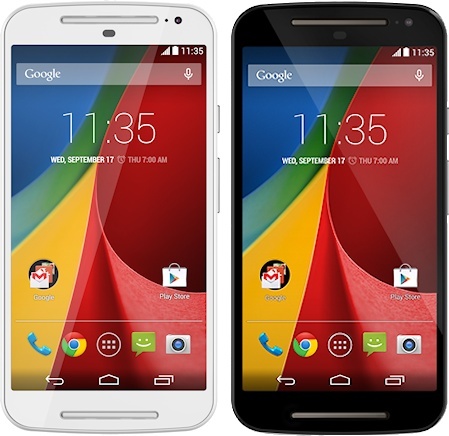 The new Moto G certainly looks more expensive than it actually is. On the subject of looks, the new Moto G has a range of interchangeable backs and come in black and white colours. Although it's hardly a beautiful device, it certainly looks quite smart. 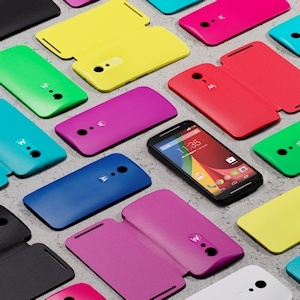 We expect that the new Moto G will be quite popular, especially for customers who buy unlocked SIM-free phones. The new Moto G is on sale today in the US, UK, France, Germany, Spain, Brazil and India with availability in more than a dozen countries slated by the end of the year.